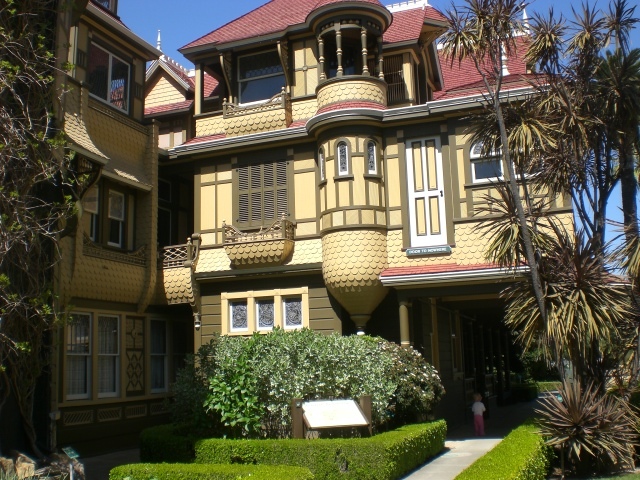 The Winchester House has fascinated me since I learned of its mistress Sarah’s obsession with the occult, the number 13, and her frantic need for redemption. Her husband William invented the rifle responsible for countless deaths during the Civil War. Sarah’s fixation with the after-life occurred after her only child died of mysterious causes as a newborn and her husband William succumbed to tuberculosis. She consulted a psychic who told her to move from Connecticut out West and to build a house for these restless spirits who had taken her loved one’s lives. Sarah believed she would be the next to die unless she built a final resting place for these vengeful souls. As long as she continued building, her life would be spared. In 1884, she purchased a farmhouse in the pristine Santa Clara Valley and hired men to work in continuous shifts. She began a strange reclusive life filled with spiritual guides, architects, and builders. Over the next 38 years, the quaint home transformed into a massive estate built over 6 acres. According to the Winchester Mystery House website, when Sarah finally passed away in her sleep on September 5th, 1922, “the house contained 160 rooms, 2,000 doors, 10,000 windows, 47 stairways, 47 fireplaces, 13 bathrooms, and 6 kitchens.” It came as no surprise to hear the house is haunted. A few years ago we flew to San Francisco planning to travel down the coast to Los Angeles. I called for reservations. As we drove to this infamous mansion, I believed we had taken a wrong turn since the area seemed to be choked with modern shopping centers. I had imagined it in a more remote location. As we pulled up to the tourist attraction, it seemed to be frozen in time. My disappointment was soon forgotten once inside its rambling halls. 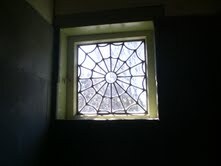 Our tour began in a room full of Tiffany stained glass windows that had been commissioned but never used. The dark oppressive place set the tone for the entire tour. The desperation of this paranoid woman could be sensed in the awkwardness of stairways going nowhere, peculiar rooms, and strange windows in sets of thirteen or containing panes of that number. We had been touring for quite a while when we arrived in a storage room Sarah had used for communing with the dead. I did not feel anything out of the ordinary, but pity for this poor woman. Moments later we arrived in another that had nothing in it, but at one time had been used for storage and was originally a hayloft. That’s when it hit me. I felt woozy and unbalanced as if the floor was moving beneath my feet. I became light-headed and nauseous. When we left the unfinished space, I took a deep breath and the queasiness went away. After the extensive tour, I brought it up with my family and another guide. “There was one room that made me feel wonky,” I said. “Oh, I felt so dizzy!” Courtney replied. “Was our experience an isolated event?” I wondered as I wrote this piece. I searched the Winchester website and found, “Alleged Hauntings.” One time when a group toured the storage room, a tourist told the guide she could still feel violence taking place by spiritual entities. 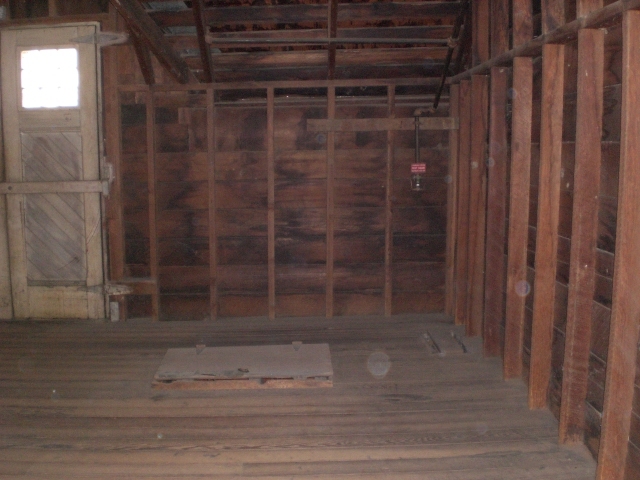 She knew that it had originally been a hayloft before the guide had mentioned it. She went on to say that long ago a fight broke out between two men. One attacked with a sharp tool which most likely killed the other. I literally got shivers down my spine after reading this story! In the last photo, you can see the trap door in the floor which had been used for pitching hay down to the horses. Can you see orbs floating in the room? This is the first time I have looked at these photos since our vacation! Do you notice anything unusual in the top photo? 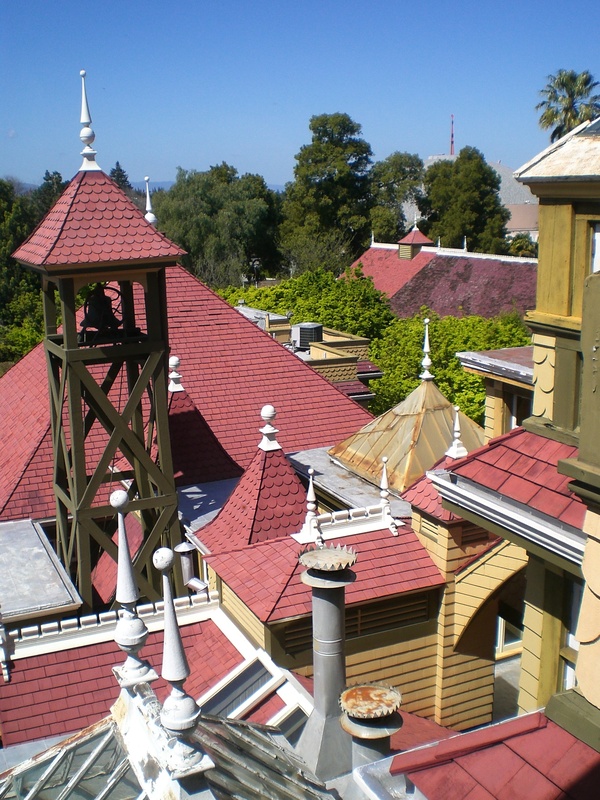 Would you ever be inclined to visit the Winchester Mystery House? For more wild adventures, click here! We went past that house last summer and thought about stopping but we didn’t. Next time we are out West, we’ll have to include it on our list of places to visit. Great story! Thanks for sharing. I was amazed at its location, but it is a tour you will never forget! I have visited this house myself in the early 1980’s, pretty intriguing place.I can imagine this is in fact haunted. I remember it a a fairly calm place, yet very odd. I did love the gardens and at the time they talked about a handyman who had simply never left and still puttered around and such. He was one of the main ghosts. The thing is, I always felt sad that those Tiffany windows never made it into anyplace there where the natural light could shine through them. It seemed such a waste. When you think it over though, the whole place was like that, a huge beautiful waste. I felt that as soon as I walked in Sheila! I also felt her anxiety. Can you imagine feeling that if the workers stopped building you would die??? 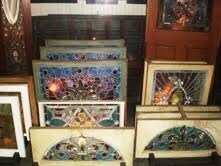 I have made some stained glass windows and the Tiffany windows were extraordinary! As to the rest of it, well, I think old Will said it best in Hamlet …. Doug thanks for stopping by to read! Man, I’d love to go there. Cool experience! It is a great tour! They never mentioned ghosts once when we were there, but I bet they do now since they include them on the website. There is a stairway that has 44 steps, but only goes down 9 feet! Jealous! I’ve ALWAYS wanted to see that house. The unusual thing in the pic above: the doorway to a big splat on the sidwalk below? Ha. My husband and I got a chance to go when we were in the area for a wedding. I only wished our kids could have gone–they would have loved it! My son missed the tour because his spring break was later. He met up with us later in the week. We have to go back! Piper I forgot about that humongous shop! Hahaha! So freakishly freaky! I’m so enjoying everyone’s Halloweenish posts! Hubby and I stayed at a place in Natchez, Mississippi and our room was positively freezing cold! And all our photos have weird images. I’d have to show you to have you believe it! I would love to see them! It sounds totally haunted!! Thanks for sharing this! Don’t know if you watch any of the ghost hunting shows on TV, but Ghost Adventures investigated this place and the episode aired last Friday I believe. Some pretty weird and creepy stuff. One of the investigators later claimed something followed him home. I never visited any haunted houses or had any experiences, but damn I think I would love too, although I’m sure I’d prove myself a bigger sissy than already believe! Thanks for stopping by to read! I was the biggest naysayer until a lot of strange things happened to me! Did you read my Stanley Hotel post? That was ridiculous! Someone haunted me for a week after that night. When I went to bed something poked me with what felt like a finger for several nights. At that time, every photo I was in had an orb in it. I haven’t seen any since…. I’ve heard of this place; very cool. Fascinating share! You would love it. So many have witnessed and felt the energy there. At the time that we went, they were downplaying the paranormal activity. Now I think that they are making it a part of their tour! Yes, I remember seeing a clip about that strange house. I’m intrigued by the photo of the empty room that got to you. The back wooded wall has some odd light on the wood. Shadowy and interesting. Good piece, well written and believable. Thanks! My daughter and I both felt sick and dizzy in that room. It was really creepy. Thanks for stopping by! of professional air conditioning repairs. Grading services involve wrecking or tearing down anyhow. No Silver Men??? That place is so strange being located right in the middle of strip mall city and yet there was a vibe. When I walked inside that storage room, I felt dizzy and sick. Amazing that others felt it too! I would love to go back. Have you spent a night at the Stanley? Yup, it is a strange location, indeed…but also like you said, once you enter its world, it’s like there is nothing else outside it. I love that place! To me…it’s quite calming…nope, never felt dizzy…just calm…. You are sensitive to paranormal activity! That is so cool that you experienced the same thing. Now that there’s a movie coming out, I can’t wait to see it! I really need to visit this place again sometime soon! Those are some IMPRESSIVE orbs! The one in the lower left corner is especially curious to me. Either it includes a spot on the floor, or it’s a really solid orb 😱! I’ve only had that nauseating feeling once when I was in a really old house that was for sale and there was an open house. I felt suddenly so ill and then when I exited the house, I was immediately better. So crazy! That feeling is REAL! I felt so woozy and off until we left the room. Now that there’s a movie with Helen Mirren about it, I have to go!! Sorry I missed your comment! Thanks for reading Miss McCupcakes!